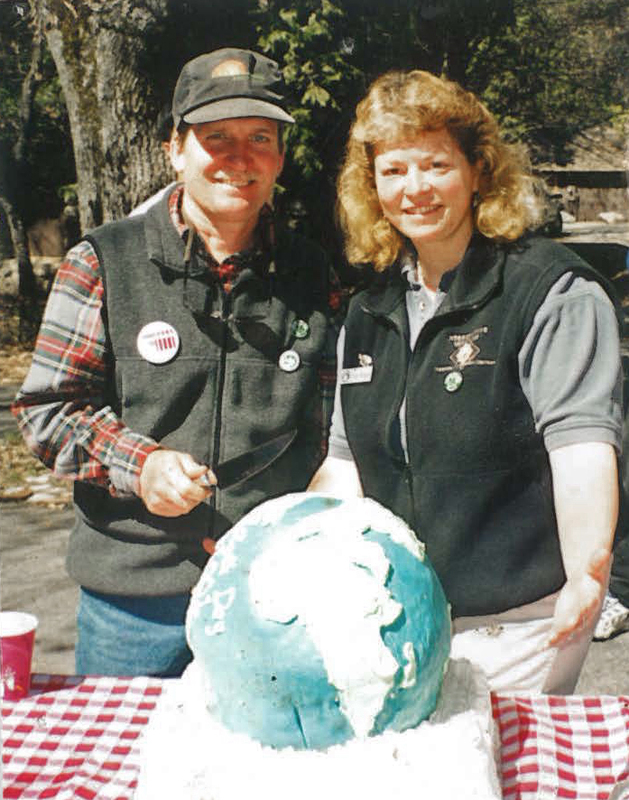 Resource Manager Mark Gallagher has been at the forefront of conservation efforts in Yosemite since the late 70s. A quiet and humble person by nature, Mark has an incredible capacity to share the spotlight. When you talk to him, you’re more likely to find out about the amazing efforts of the people around him rather than his own substantial accomplishments. However, that doesn’t stop him from quietly and humbly making a big difference in Yosemite. When he isn’t out enjoying the park in his personal time, Mark and Assistant Resource Manager, Debora Sanches, are involved in a wide array of environmental projects and programs within the park, from managing recycling and composting programs, to investigating alternative fuels and transportation options, or setting up green-purchasing guidelines. 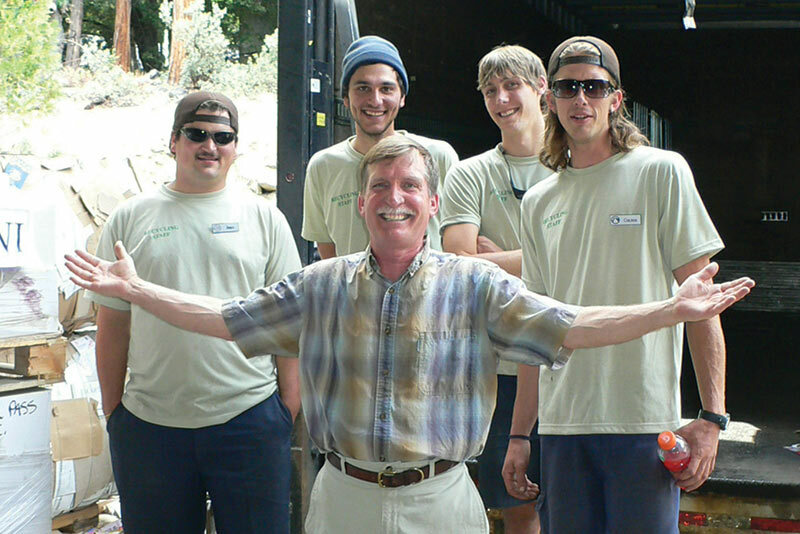 Mark (front) in 2010 with some of the recycling crew. YIF: What first brought you to Yosemite? When did you first visit? When did you move to the area? Mark: I first came to Yosemite in 1977 on a road trip after college. I heard it was a beautiful place and wanted to see it myself. Oddly enough on the day we were leaving the park we stopped at El Cap Meadow to take some photos and I remember saying that this would be a great place to live! I came back for a summer job in 1979 and never left. YIF: What different jobs have you done in the park over the years? Mark: I started out as Supervisor of Recycling and “picked up” additional duties throughout the years. I’d like to think I built my “empire” taking on jobs that others did not want. YIF: What inspired you to focus on conservation? Mark: Garrett DeBell influenced me early in my career to get involved with resource issues in Yosemite. 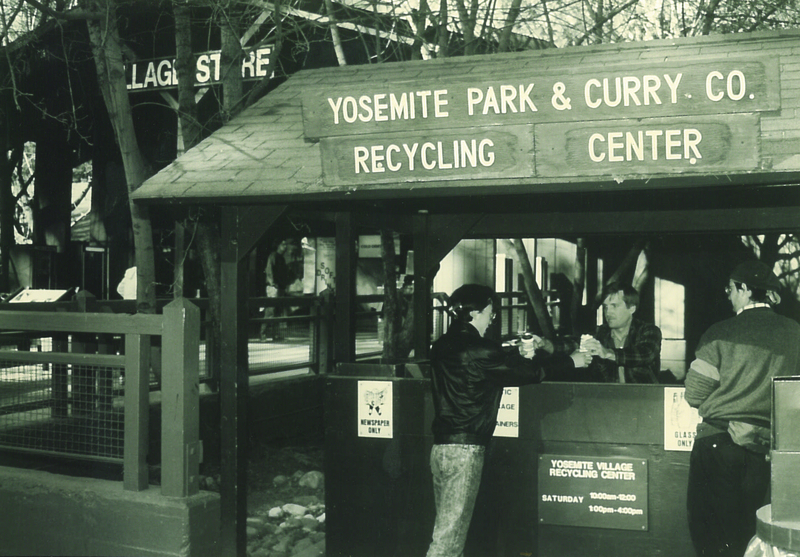 Garrett was passionate about the environment and worked a great deal with the prominent environmentalist David Brower before and after his tenure as a Yosemite Park & Curry Co. Environmental Consultant. That really gave me my start. YIF: GreenPath, the environmental management program for concession company Delaware North at Yosemite got its start in the park. Tell us about how you got started with GreenPath. Mark: Simple… I was asked by management to get involved. It made sense, as Resource Manager the work I was doing fit right into what we were trying to accomplish with GreenPath. There were many of us that were originally involved with starting GreenPath in Yosemite, and several are still here (Yolanda Cheley, Dan Lyle, Brett Archer, Vicki McMichael). I saw early on that with a larger diverse group you could get more accomplished than with a few individuals pushing for change. Vicki McMichael & John Huey deserve the credit for developing our environmental management system we call GreenPath. YIF: During your time in the park, Yosemite has taken some big strides toward protecting the environment. What are some of the steps that you have felt most proud of, or which have been most meaningful to you? Mark: Being part of Yosemite National Park’s Bear Council & working with National Park Service Wildlife staff has been meaningful to me. There were some grim years for bears between 1996 & 1998. It took an intense effort by NPS, Delaware North, Yosemite Association & many others to turn the tide on bear incidents. Together they made huge strides towards protecting Yosemite’s bears. YIF: Which jobs stand out in your mind as being particularly interesting/fun/rewarding? Why? Mark: Integrated pest management (IPM) and working with trees is most interesting to me, because the people I work with share their knowledge, and there is so much to know about these subjects. The restoration projects that we have done in the High Sierra Camps and different areas in Yosemite Valley to define trails and rehabilitate areas that have been trampled have been the most fun and rewarding at the same time. It’s satisfying because of the volunteers I work with and knowing that the restoration work that was accomplished will probably outlive me. YIF: From a personal perspective, what are some of your favorite things to do in the park? Mark: I enjoy hiking, fishing and X-C skiing. What first drew you to fly fishing? Is it the same thing that keeps you excited about it now? Mark: I always enjoyed fishing. As far as fly fishing. My wife, Noreen, bought me my first rod. She likes to think she taught me how to fish. She says that I’m passionate about the sport. Don’t tell her…. it really is an addiction! I like fly fishing because you never master all aspects of the sport. There is always something to learn. YIF: Do you have a favorite spot that you’re willing to share with us? Where is it and why is it your favorite? Mark: The Merced River is a beautiful place to fish, and was one of my favorites in Yosemite. Unfortunately, with the last few years of drought, the water temperature has gotten much warmer and it’s really impacted the fish and the fishing. Right now, my favorite spot to fish is the Pit River in Northern California. When I dream of fishing I dream of fishing “The Pit”! Restoration of Tuolumne Meadows Lodge in 2008. Since 1916, concessioners in Yosemite National Park have provided wilderness experiences for thousands of visitors by operating the Yosemite High Sierra Camps in some of the park’s most beautiful backcountry locations. High Sierra Camps are spaced 5.7 to 10 miles apart along a loop trail in Yosemite’s high country, accessible only by foot or saddle. After decades of operation, the once pristine camps became impacted by heavy visitor use combined with minimal land management. Merced Lake High Sierra Camp, the largest, oldest and most remote of the high camps was the first to benefit from planned restoration efforts, which began in 2001. DNC Parks & Resorts at Yosemite employees worked to restore the camp with the guidance of the National Park Service at Yosemite. Restoration workers at Merced Lake High Sierra Camp. The success of the Merced Lake restoration inspired DNC to plan extensive restoration projects for the other High Sierra Camps during the summers of 2005 and 2006. The plan was expanded to include White Wolf Lodge in 2007 and Tuolumne Meadows Lodge in 2008. 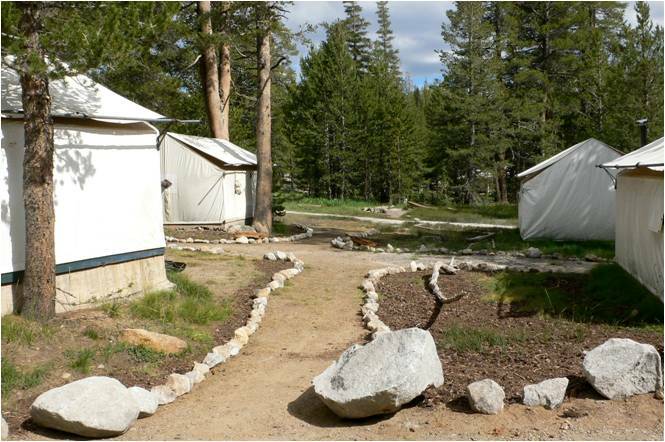 Since then, most High Sierra Camps have benefited from multiple efforts at ecological restoration. 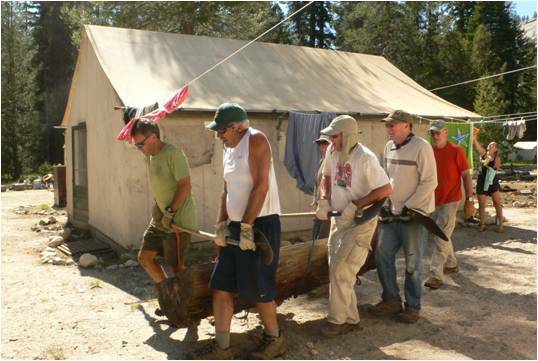 In 2011, ten years after the first restored pathway, it was time for the restoration crew to go back to Merced Lake High Sierra Camp. DNC partnered with the National Park Service and Yosemite Conservancy to improve the ecological health of the camp with grounds maintenance. A group of 11 Yosemite Conservancy volunteers lead by DNC environmental managers Mark Gallagher and Debora Sanches donated 416 hours of labor to Merced Lake – helping to restore the camp to a more natural condition. The ecological restoration techniques included soil decompaction; collection and spread of native seeds and duff; transplanting native plants; trail delineation, erosion control and the creation of proper drainage for run-off. Merced Lake High Sierra Camp during restoration in 2011. 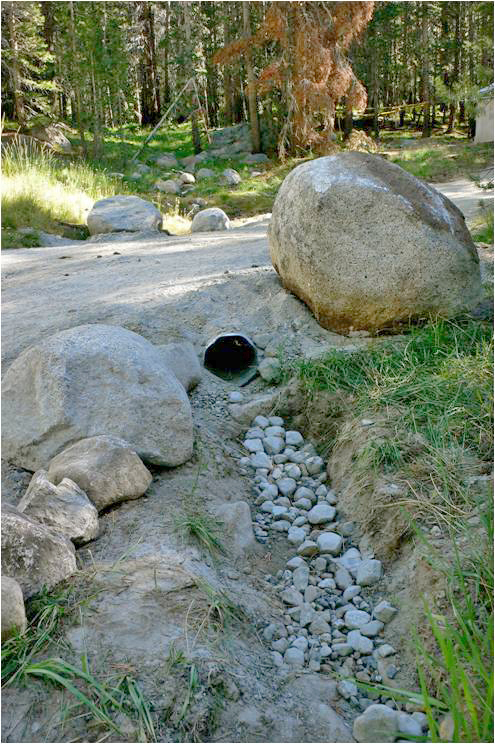 Restored drainage at Tuloumne Meadows Lodge in 2008. 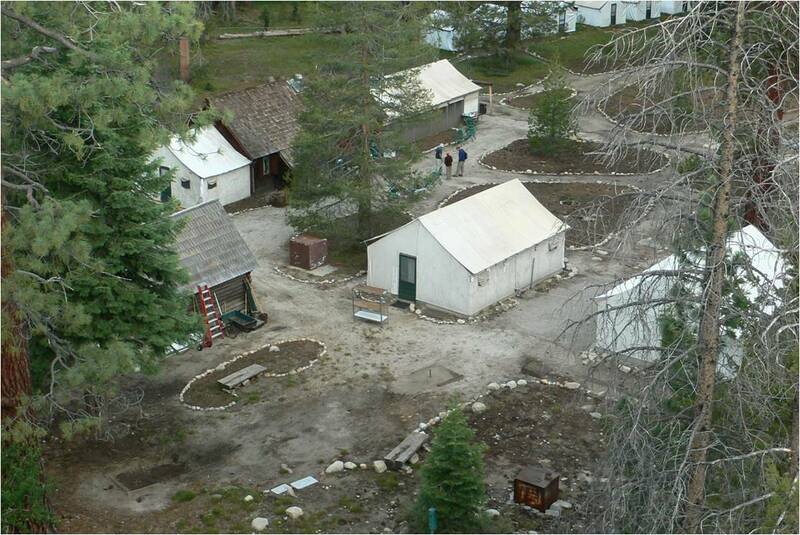 In 2012, two major restoration projects took place at May Lake and Glen Aulin High Sierra Camps. In addition to trail delineation, decompaction and spread of duff in closed-off areas, volunteers also helped with deferred maintenance work such as roof replacement, corral post and hitching rails additions, plumbing improvements to prevent water waste and lodge foundation replacement. 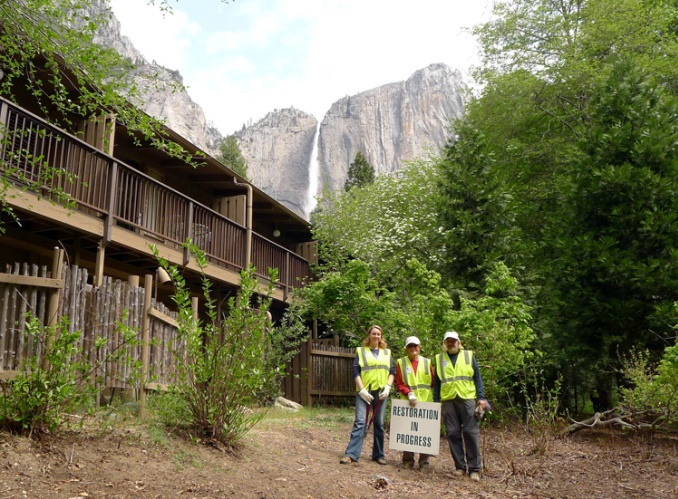 In addition to the High Sierra Camps, DNC Parks & Resorts at Yosemite recently started work on a two-phase ecological restoration project at Yosemite Lodge at the Falls – also in partnership with National Park Service and Yosemite Conservancy. The restoration work includes removal of dirt roads, social trails, & non-native plants, and also transplanting of site-specific native plants and seeds. Yosemite Conservancy recruited 15 volunteers to work on the first phase of the project. DNC will work with the National Park Service at Yosemite to source native vegetation seeds in Yosemite National Park to be planted at the site in October. Restoration at Yosemite Lodge at the Falls in 2014. 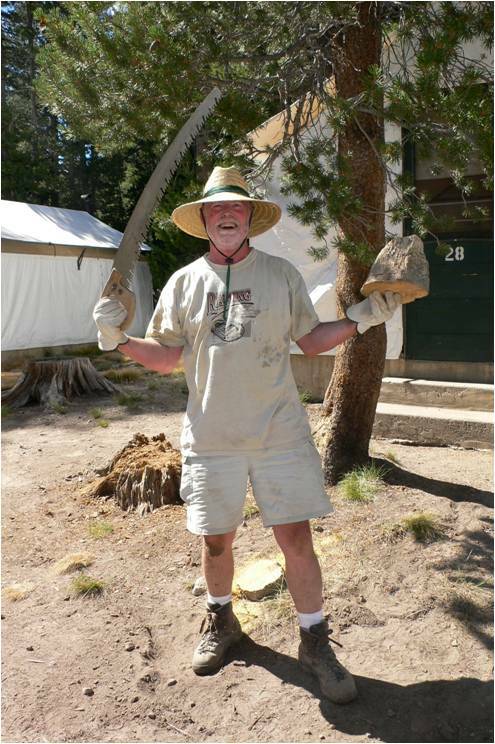 Badger Pass Ski Area and Bike/Raft Rental Manager Sean Costello at the Tuolumne Meadows Lodge restoration in 2008. 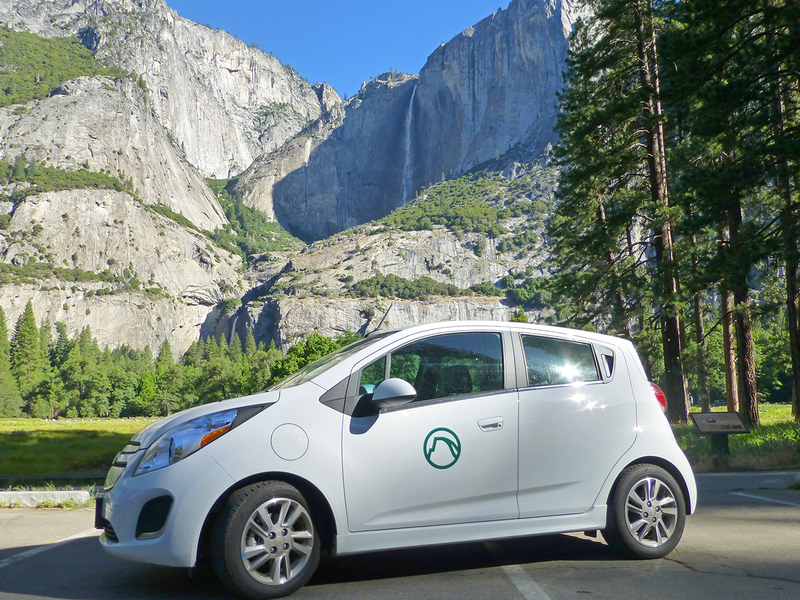 DNC Parks & Resorts at Yosemite’s newest fleet vehicle – the Chevrolet Spark. To keep Yosemite National Park a little greener during a California drought, DNC Parks & Resorts at Yosemite has introduced two new ways for employees to travel in Yosemite Valley that requires no fossil fuel consumption and adheres to the guidelines of the company’s GreenPath sustainability program. In the first case, an all-electric vehicle was added to the fleet – the Chevrolet Spark. Unlike the hybrid shuttle buses that operate in Yosemite Valley, the Spark plugs in and runs on electric charge only. The Spark is also sized smaller than your average vehicle to make that charge last longer. Used primarily as a mail delivery vehicle in Yosemite Valley, the Spark can go for 82 miles on a single charge! We compared the smallest vehicle in our fleet to the largest horse in our stables, Goliath, and found more horsepower and less emissions with the economically-sized Spark. 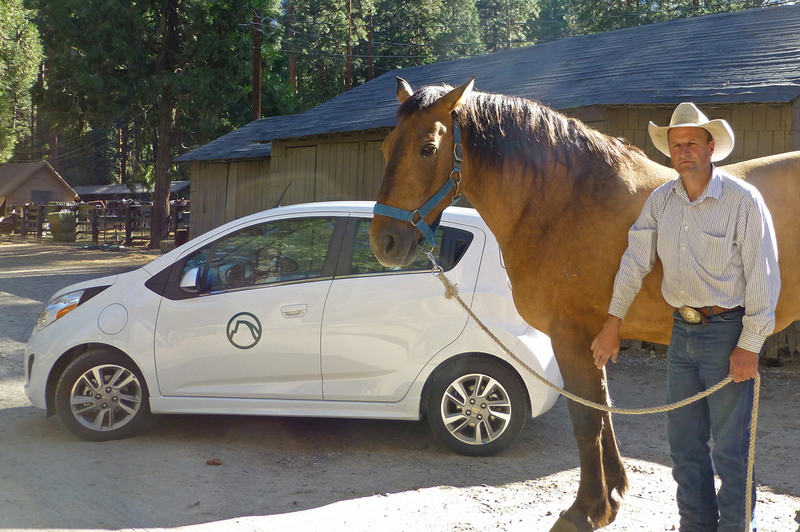 The Chevrolet Spark, Goliath the Horse and JR the Stables manager in Yosemite. Along with adding the Spark to our fleet, the new Employee Bike Thing rolled out this summer. 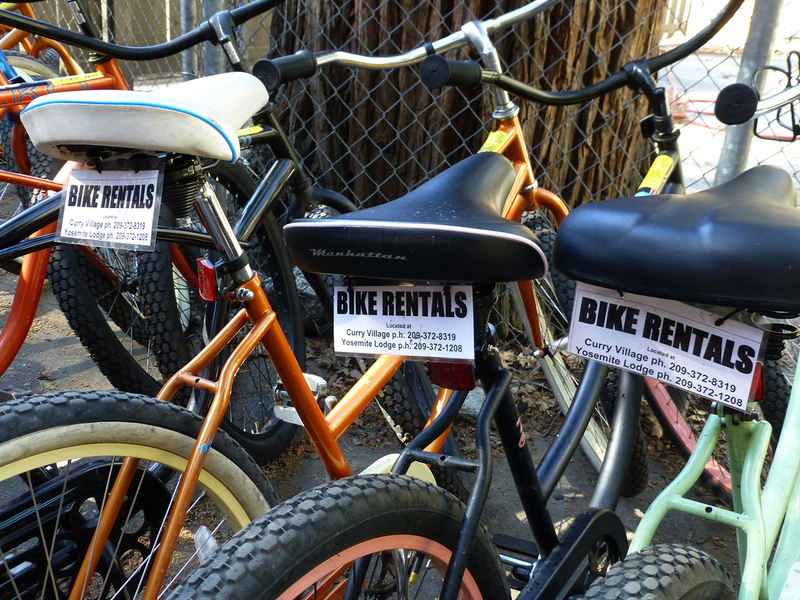 This employee bike rental program employs 40 retired rental bikes from Yosemite’s bike stands as new transportation for Yosemite Valley employee residents. Each cruiser style bicycle is assigned to an employee for the entire summer season with a required security deposit. When the bike is returned at the end of the season, a full refund is issued. This new program helps DNC associates get to work on time, provides a daily dose of exercise and lessens traffic congestion in Yosemite Valley. The Employee Bike Thing will also allow new associates to explore Yosemite Valley and provide more opportunity for adventure. Matt and Jeff enjoy their new ride from the Employee Bike Thing. If you can’t tool around Yosemite Valley in an all-electric vehicle, bike riding is definitely the way to go. Though not a participant of DNC’s Employee Bike Thing, Yosemite National Park’s Superintendent, Don Neubacher, also commutes in Yosemite on his bike. 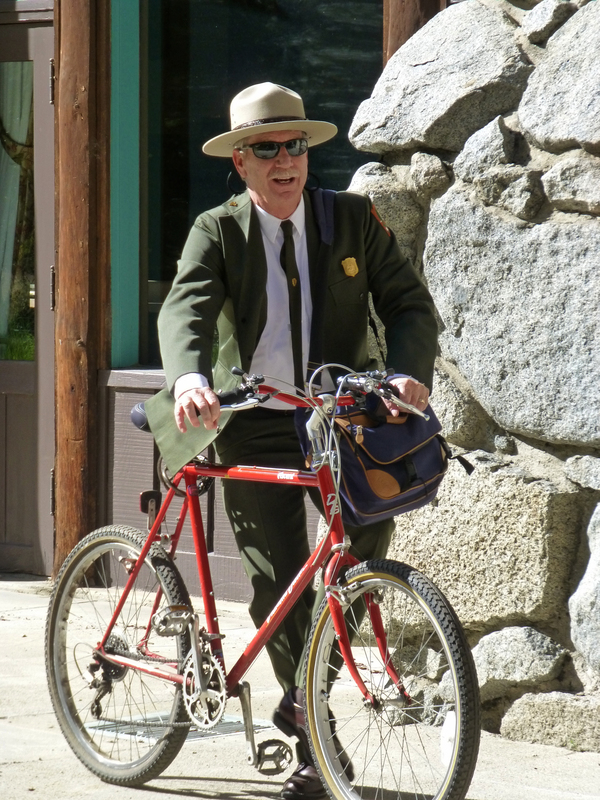 National Park Service Superintendent Don Neubacher also bikes to work in Yosemite. Each spring on Earth Day, DNC Parks & Resorts at Yosemite partners with Yosemite National Park to celebrate our commitment to the environment by sponsoring an event located at the Yosemite Valley Visitor Center. The Earth Day Mall Celebration takes place on Earth Day April 22, 2014 and features food, fun and scheduled activities for all ages available from 9:00 am to 9:00 pm. Park visitors are invited to have lunch at the sustainable ingredient salad bar, participate in a ranger walk or talk, finish spring cleaning by recycling electronics at the Yosemite Village Recycling Center, take a photography walk with the Ansel Adams Gallery, and introduce children to yoga with a family-friendly session. 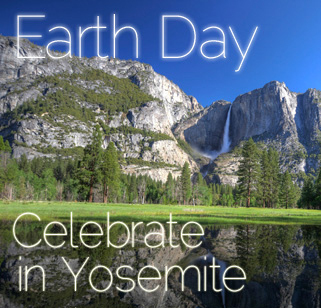 In addition to the mall celebration, the Earth Day Bike Ride in Yosemite Valley occurs the weekend prior to Earth Day on Saturday April 19, 2014. 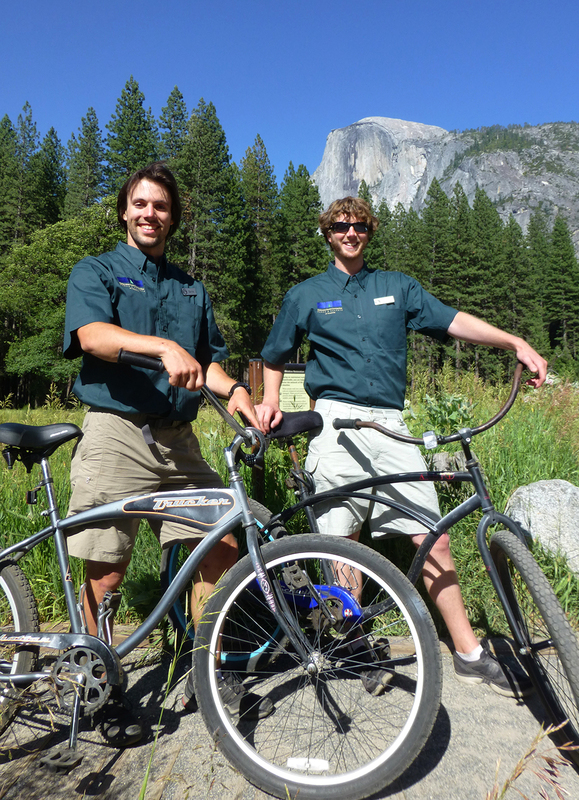 On the Earth Day Bike Ride, explore Yosemite Valley with Yosemite National Park and park partner staff for a fun and educational guided bike tour. Park partners include the Yosemite Conservancy, NatureBridge and Balanced Rock Yoga. This guided tour of Yosemite Valley bike paths features stops at information stations that provide the latest news about Yosemite’s environmental efforts. Subjects include preservation of endangered wildlife such as the Pacific Fisher, restoration of Yosemite’s trails and native habitats, identification of lichen and moss and techniques for conifer tree removal to maintain the health of Yosemite’s trees. Earth Day Bike Ride participants meet at 2:00 pm at the Curry Village Bike Stand. Each ride tours Yosemite Valley on designated bike paths with scheduled stops at information stations directed by a volunteer tour leader. The bike tour is appropriate for all experienced riders and lasts approximately three hours. Park visitors are welcome to bring their own bikes to participate in Earth Day Bike Ride and bike rentals are available for experienced riders at the Curry Village Bike Stand. The cost of Earth Day Bike Ride is $5.00 per person. This fee includes bike rental for the tour. Space is limited and advanced sign up is required. Information and tickets are available at any Tour & Activity Desk in Yosemite Valley and by calling Yosemite Activities Reservations at 209-372-4386. 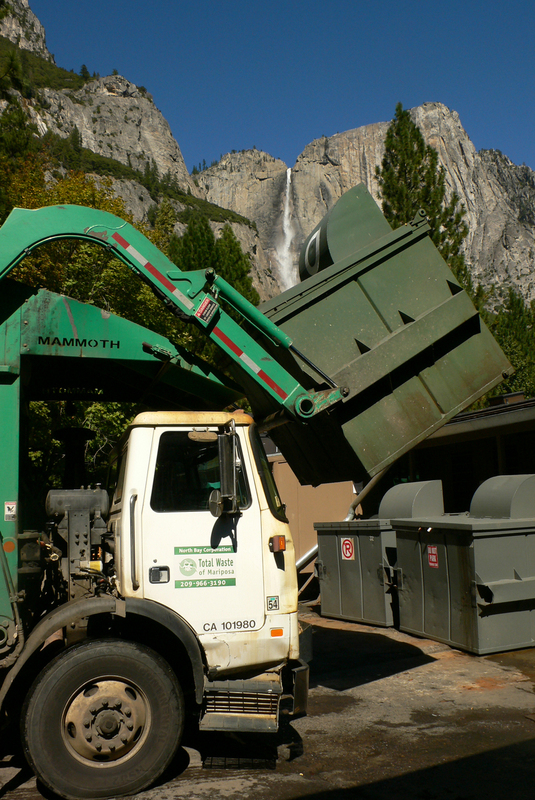 For park visitors, the image of a garbage truck in Yosemite National Park is not the souvenir that represents American wilderness or precious family vacation memories. Yet, the garbage truck and the purpose it serves are a very important part of maintaining lodging and services in the park. How we go about utilizing this service and the impact on the park itself are top concerns for the concession operations managed by DNC Parks & Resorts at Yosemite. A sense of stewardship gave rise to GreenPath®, a formal, documented and comprehensive plan covering just about everything we could think of to preserve and protect natural resources. 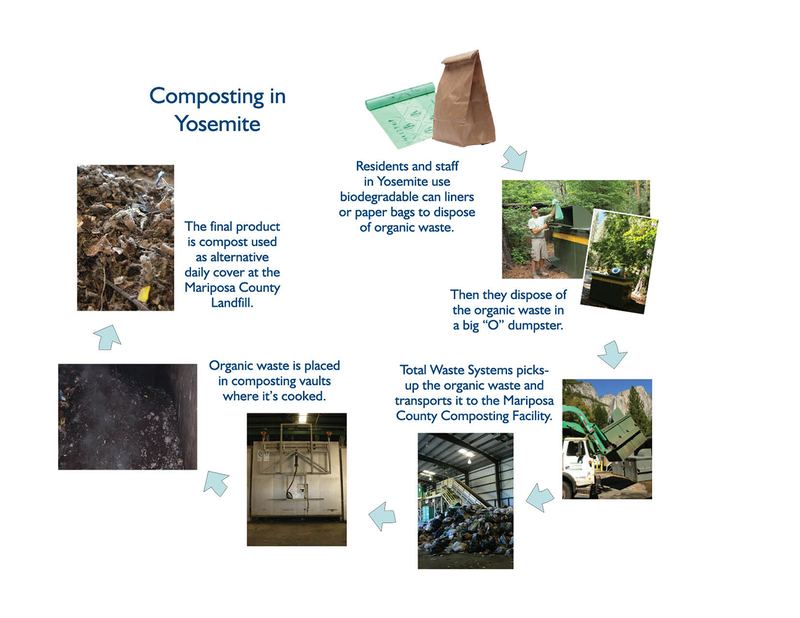 In Yosemite, DNC recycles over 30 different types of materials and we are justifiably proud of our extensive recycling program in one of America’s most treasured landscapes, but did you know that we also have a composting program? Composting can be viewed as the recycling of organic waste and makes up more than 10% of waste coming from the park that is diverted from the landfill. DNC Parks & Resorts at Yosemite works in cooperation with the Mariposa County Landfill, Recycling and Composting Facility located 48 miles outside of Yosemite National Park. 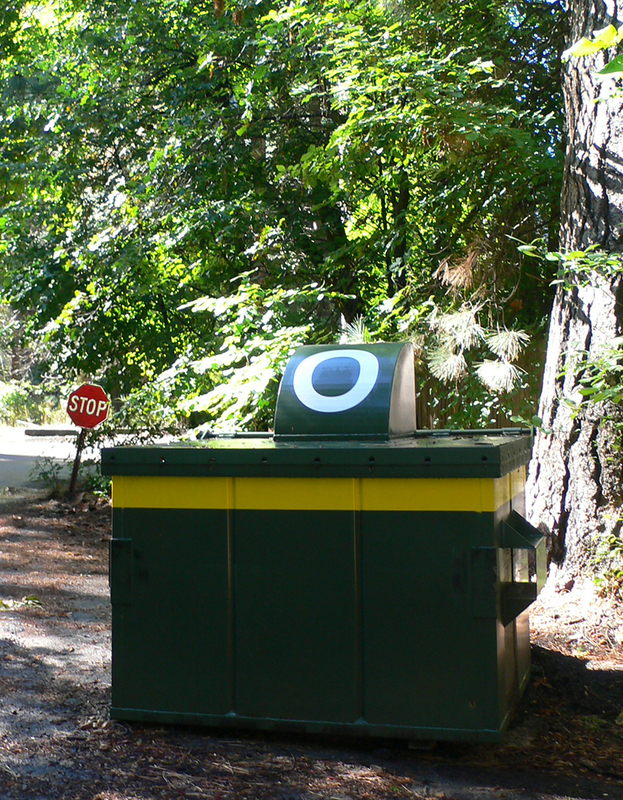 Mariposa County collects organic waste along with garbage in the same trucks – but from separate waste collection bins marked with an “O” for organic – reducing transportation costs. Organic waste includes materials such as kitchen waste, biodegradable utensils, cups and plates and of course, leftover prepared food. With 25 restaurant locations and 8 stores offering grocery items in the park, food waste can be significant. All commercial kitchens in Yosemite have designated compost collection bins, including the High Sierra Camps where waste has to be packed out by mule or horse. In addition to restaurants, three food & wine events that impact the composting process are hosted in the park at The Ahwahnee each year: Vintner’s Holidays, Bracebridge Dinner at Yosemite, and Chefs’ Holidays. However, not all organic waste is generated by park visitors – park residents also separate their compostable waste. In Yosemite, the employees are also community members and stewards of public lands. This is just one component of DNC’s GreenPath program, dedicated to preserving and protecting the natural resources of the special places where we provide hospitality services. We can take pride in the fact that with the addition of the composting program in 2009, our recycling practices result in 65% of the waste generated by DNC-managed park operations is diverted from the landfill each year. Just in time for spring camping season, the Curry Village Gift and Grocery store in Yosemite National Park has been remodeled with updated offerings in grocery, basic camping supplies and park souvenirs. On March 22 after a month-long closure, the store re-opened with a brand new look enhanced by improved lighting and a reconfigured sales floor with more space to shop. The focus of the remodel emphasized environmentally-friendly measures including the re-purposing of display fixtures, energy-efficient lighting and eco-friendly flooring. Updates include LED lighting that is compliant with California building and energy codes for increased sustainability, as well as stained concrete flooring that eliminates the need for carpet. 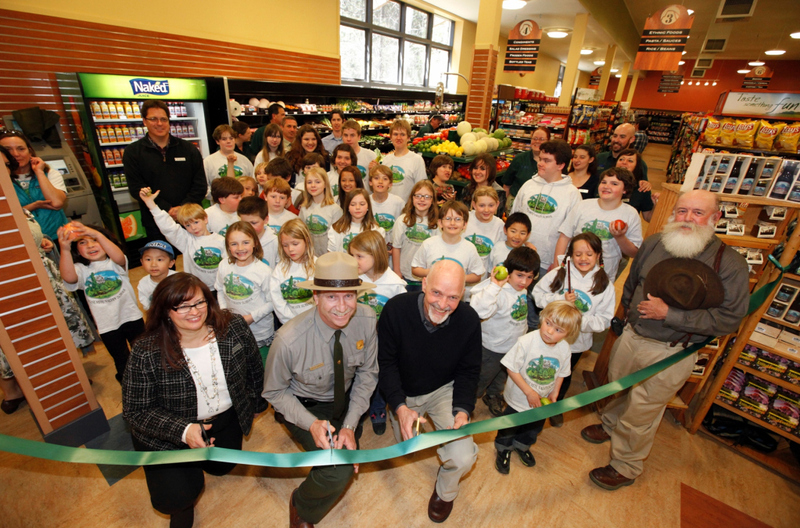 Campers and hikers will find an expanded grocery section featuring more fruits and vegetables along with snack foods, beer, wine, and camping needs such as bagged ice, charcoal and firewood. Park visitors will find Half Dome “I Made It To The Top” souvenirs have been updated with a vintage-style look and spring souvenir t-shirts featuring Yosemite’s bears. 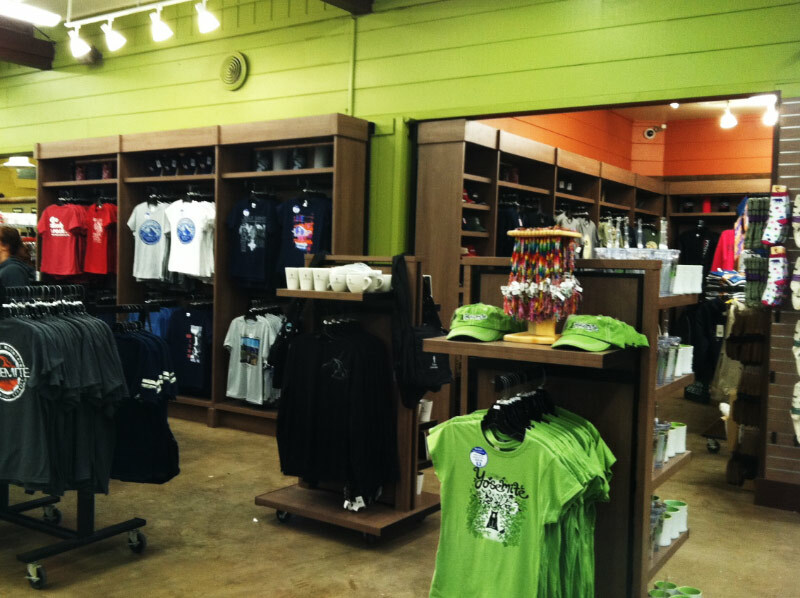 Located next to The Mountain Shop in Curry Village, the gift and grocery store will continue to feature updated offerings throughout the summer season. 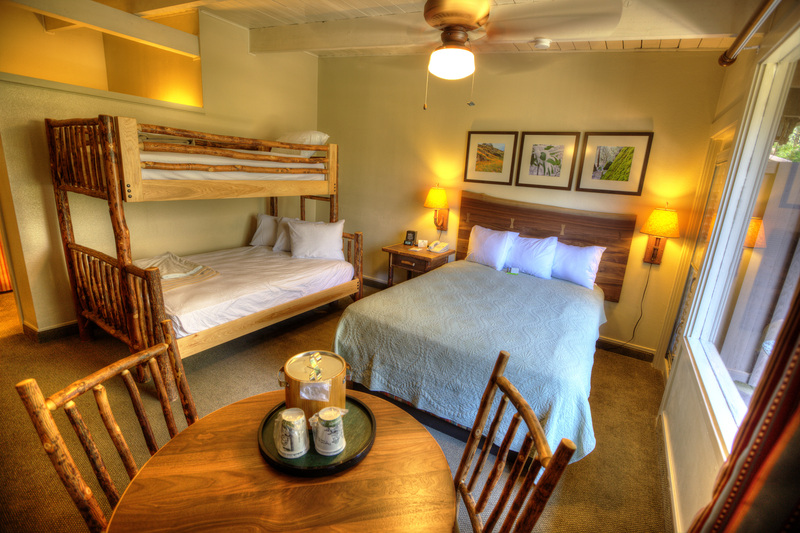 Reservations for Curry Village are still available for the summer. 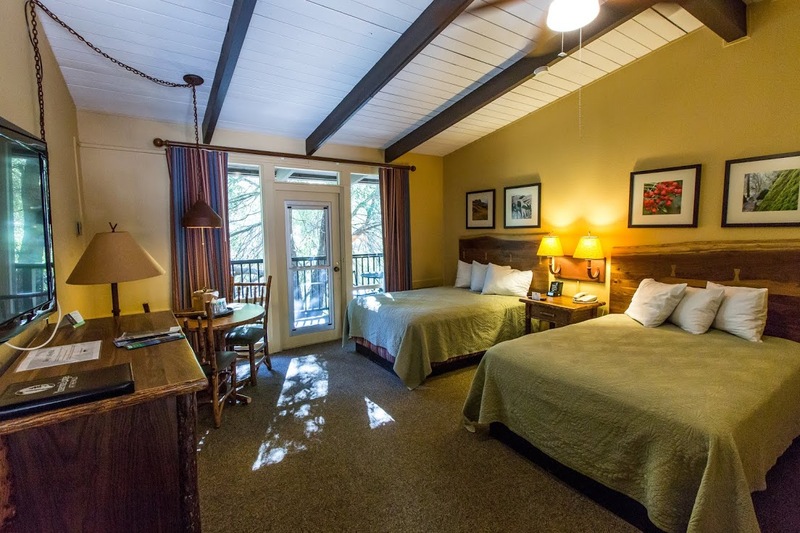 To learn more information about Curry Village or make a reservation, visit Yosemite Accommodations. Delaware North Companies (DNC) Parks & Resorts at Yosemite President Dan Jensen led a community event and ribbon cutting ceremony on April 3, to celebrate the completion of a $1.15 million dollar eco-friendly remodel of the Village Store. The event dedicated the newly refurbished store highlighting its 25 percent energy use reduction, sustainable design features and locally grown organic produce. Special guests at the event included National Park Superintendent Don Neubacher, and Tom Willey of T&D Willey Farms, whose locally grown, organic vegetables are featured in the new produce section. Yosemite Valley students also participated in the event, selecting healthy food snacks from the many options available in the store, and enjoyed the organic carrot cake served to the public following the event.